After having watched a few live performances of Leon Redbone on the very first season of Saturday Night Live, my old roommate and I found ourselves hooked on the Blues performed by this handsome man. We'd listen to his stuff on repeat way when, and it always stuck with me. 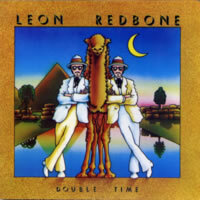 Years later, I have, myself, acquired a CD of Leon Redbone's Double Time, an album of 11 songs performed by the legendary Leon Redbone and a few guests depending on which song is performed (the insert explains who all worked with him on each song). Of the tracks, three of the more notable are Diddy Wa Diddie, Shine On Harvest Moon, and Mr. Jelly Roll Baker. Diddy Wa Diddie is the opening song on the album and is a fun one with one of the most peppy beats, all about Leon expressing how he desires someone to explain to him what exactly "diddy wa diddie" means. Shine on Harvest Moon is a calmly paced song about how a man expresses his sorrow to the beautiful harvest moon in the sky shining down on him. A personal favorite of mine. Finally, Mr. Jelly Roll Baker is just a fun song, talking about the virtues of eating freshly made jelly on freshly baked bread, and even features a spot of dark humor when explaining how crazy he and others are for this jelly, most notably when he tells of how a nurse just abandons her post because she'd rather let a guy die than miss out on getting a jelly roll. I, for one, suspect drugs are involved. Now, I'd like to say that I'm not one of these super musically inclined folk, nor am I super knowing of the lore behind every gosh dang song there is, so please forgive me if I have insulted the more knowing enthusiasts of you out there. However, I will say that the folksy and bluesy tunes of this album are rather nice to chill out to. Just sippin' on some iced tea during a hot summer day, listening to this man play his guitar, muttering out stories of varying kinds. And then we have the Sheik of Araby where Leon has a temporary stroke of madness and blathers like a motor vehicle for a good few minutes.